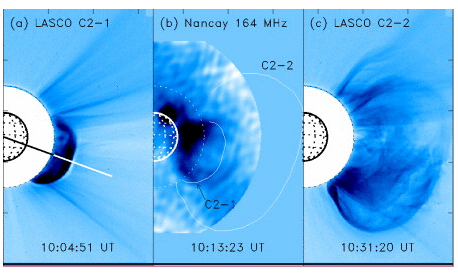 Panel b shows an ensemble of expanding loops which closely looks like the white light CME imaged in Panels a and c. These loops, so-called radio CME, are detected up to 3Rs behind the CME front. 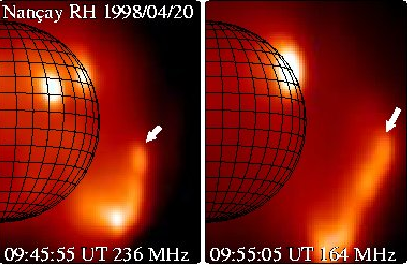 The white lines in b indicate the position of the leading edge of the CME at the times shown in a and c.
NRH images showing the outward progression of a weak type II radio source(indicated by the arrows at two different frequencies. The source in the northern quadrant is a stationary noise storm.